It is a pity that Indian history books don’t teach about the outstanding achievements of the Jains on mathematical and scientific knowledge. Nīgaṇṭha Nātaputta is identified with the Jain teacher Mahāvīra by historians. A lot of deliberate misconception has been created by colonial era historians and their Marxist followers regarding the nature of the relationship between Jains and Hindus. Colonial era historians were not objective historians and they were using history as an imperial tool to subjugate their subjects with the aim of exploiting the natives for as long as they could. The British policy of divide and rule starts at the very beginning of Indian history by dividing Indians into Aryans and Dravidians and then using it to create a divide between North Indians and South Indians. British rulers also recognized that the main challenge to their occupation of India was going to come from the Hindu majority who still had the memory of a glorious past. To prevent the rise of Hindu nationalism, colonial era historians sought to undermine the Vedic culture by representing it in a negative light and glossing over the atrocities committed by the invaders. Under this scheme of things, Jainism and Buddhism are presented as a revolt against Vedic rituals, animal sacrifice and caste system. Caste system did not exist back then and animal sacrifices were infrequent. Aśwamedha sacrifice is given as an example of the prevalence of animal sacrifice, but this sacrifice was part of a ceremony that lasted for a year and was conducted to achieve the title of paramount lord over neighbouring kings. Obviously, this cannot be a frequent exercise, not more than a couple of times in a century. So historians are making a case for the prevalence of animal sacrifice based on the killing of a couple of horses in a century! In many cases of Vedic rituals, animal sacrifice was symbolic and did not involve the slaughter of an animal. Moreover, the path that Buddha chose was a result of his personal quest and was in no way a revolt against the Vedic way of life. In the case of Jains, this argument is totally bogus as Mahāvīra was not the founder of Jainism. He was the 24th Tīrthaṅkara and arguably Jainism is as old as the Vedic religion. Though details about the lives of first 22 Tīrthaṅkaras are given in the Jain texts, it is difficult to reconcile them within a historical framework as the time periods assigned to them goes too far back in time. The details about the life of 23rd Tīrthaṅkara Pārśvanātha, though, make it possible to assign a historical time period to him. Pārśvanātha was born to king Aśvasena and Queen Vāmādevī of Kāśī. He lived his life as a prince of Kāśī till he was 30 years of age. Pārśvanātha lived for 100 years and departed this world 246 years before Mahāvīra’s Nirvāṇa. Assuming 526 BCE as the year for Mahāvīra’s Nirvāṇa, Zimmer has calculated that Pārśvanātha was born in 872 BCE and his Nirvāṇa took place in 772 BCE . He had become an ascetic at the age of 30, which took place in 842 BCE according to Zimmer. In my earlier article “A new dating of Mahāvīra based on Mālava era”, I had shown that Mahāvīra lived between 1244-1172 BCE. In this alternative chronology, Nirvāṇa of Pārśvanātha took place in 1418 BCE counting 246 years from Nirvāṇa of Mahāvīra in 1172 BCE. Thus Pārśvanātha lived between 1518-1418 BCE. He became an ascetic in 1488 BCE when he was 30 years of age. He attained Nirvāṇa atop a mountain peak Shikharji, which is an important pilgrimage site for the Jains. The mountain range containing Shikharji is named after Pārśvanātha and is called Parasnath range. It is located in Giridih district in the state of Jharkhand. Throughout history, Jains have lived in perfect harmony with the Hindus. Jains and Hindus have shown mutual respect for each other’s way of life, and they have many points in common, such as the stress on non-violence and truthfulness. However, Jain cosmology is vastly different from Hindu cosmology. In this article, we will focus on Jain cosmology and the extraordinary contribution of Jains to mathematics resulting from their deliberations on their cosmology. 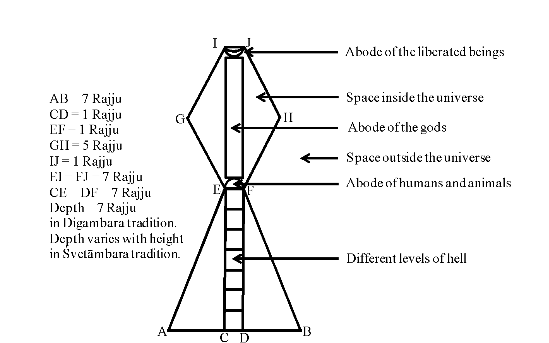 The shape of the universe according to Jain cosmology is shown in Figure 1. The base of the universe is 7 Rajju wide. It gradually tapers to 1 Rajju wide in the middle at the height of 7 Rajju. It then increases gradually to 5 Rajju and then tapers back to 1 Rajju at the top. Total height of the universe is 14 Rajju. The depth of the universe is 7 Rajju in the Digambara tradition and thus the volume of the universe in this tradition is 343 cubic Rajju. Depth of the universe changes with height in the Śvetāmbara tradition and the volume of the universe in this tradition is 239 cubic Rajju. Rajju is a very large unit of length and is equal to the distance a deity traverses in six months flying non-stop at the rate of 2,057,152 yojanas in an instant. A yojana is about nine miles. The space inside the universe is called Lokākāśa and the space outside the universe is called Alokākāśa. Universe is divided in three main parts. Gods live in the upper half (Urdhva Loka or upper world) and various types of hell are located in the lower half (Adho Loka or lower world). At the very top of the universe is the abode of liberated beings. Humans and animals live in the middle of the universe (Madhya Loka or middle world). At the centre of the middle world is the island called Jambudwīpa and at its centre is a mountain called Meru. The diameter of Jambudwīpa is 100,000 yojana or about 900,000 miles. Jambudwīpa is surrounded by an annular ocean, which is surrounded by an annular island. This island is surrounded by an ocean, which is again surrounded by an island. The number of these concentric islands and oceans is extremely large. The diameter of each successive continent or ocean is double that of previous one. The estimation of the size of Rajju by calculating the diameters of the rings of oceans and continents contained in the middle world led Jains to very large exponents with base 2. The universe has neither a beginning nor an end in time according to Jain cosmology. The Jain time cycle consists of two halves, Utsarpiṇī and Avasarpiṇī. Each half is further subdivided in six parts. Each part consists of a combination of Suṣamā and Duḥṣamā. Suṣamā denotes happiness and Duḥṣamā denotes unhappiness. Suṣamā Suṣamā denotes extreme happiness, while Duḥṣamā Duḥṣamā denotes extreme unhappiness. The Jain time cycle starts with a period of extreme unhappiness and gradually moves to a period of extreme happiness in the first half. In the second half, it starts with a period of extreme happiness and ends with a period of extreme unhappiness. Jain time cycle was extremely vast and is shown in Table 1. We can see from this table that Jains dealt with numbers that were unbelievably large and no other civilization were equipped to deal with such numbers. An example of an unimaginably large number in modern mathematics is a Googol, which is equal to 10100. Google is a misspelling of Googol by its founders. Jain number for years in a Sīrṣa Prahelikā is larger than the square of Googol! Even this number was a small number for Jains, who proposed the unit Palyopama for an innumerable amount of time. They went even beyond this number postulating one quadrillion Palyopama in one Sāgaropama. One time cycle of Jains consisted of two quadrillion Sāgaropama. Dealing with such immense numbers led Jains to make many important contributions to Mathematics far ahead of their rediscovery in modern times. Important Jain texts detailing mathematical knowledge are Sūrya Prajñapti (4th or 3rd century BCE), Jambu Dwīpa Prajñapti (4th or 3rd century BCE), Sthānāṅga Sūtra (2nd-1st century BCE), Uttarādhyayana Sūtra (2nd-1st century BCE), Bhagavatī Sūtra (2nd-1st century BCE), and Anuyoga Dvāra Sūtra (2nd-1st century BCE) . The Sthānāṅga Sūtra divides the study of mathematics under ten different sections: parikarma, vyavahāra, rajju, rāśi, kalāsavarṇa, yāvat-tāvat, varga, ghana, varga-varga and vikalpa. Parikarma dealt with simple arithmetic calculations such as addition, subtraction, multiplication and division; vyavahāra with advanced arithmetic; rajju with geometry; rāśi with mensuration; kalāsavarṇa with fractions; yāvat-tāvat with linear equations, varga with quadratic equations; ghana with cubic equations; varga-varga with biquadratic equations; and vikalpa with permutations and combinations [5-6]. Jains divided numbers into three types: enumerable, innumerable and infinite. Anuyoga Dvāra Sūtra describes five types of infinity: infinite in one direction, infinite in two directions, infinite in area, infinite everywhere, and infinite perpetually . The distinction between different types of infinities such as countable infinity (e.g. integers, rational numbers) and uncountable infinity (e.g. real numbers) was proposed by Georg Cantor in 1883. Jains had proposed similar ideas nearly 2,000 years before Cantor. The concept of logarithm on base 10 was proposed by John Napier in 1614. Jains had developed the concept of logarithm more than eight centuries before its discovery in the west. It also says that the formulas can be extended to numbers up to infinity. These discoveries predate the development of the theory of permutation by Fabian Stedman in 1677 by over eighteen centuries. Jain text Trilokaprajñapti written by Yativṛṣabha gives formulas for the first term, common difference, number of terms and sum of terms of an arithmetic progression . This text was written in 500 CE and predates the treatment of arithmetic progression by Carl Friedrich Gauss in late eighteenth century by nearly thirteen centuries. Jain mathematician Halāyudha wrote a commentary on Piṅgala’s Chhandahsūtra in tenth century CE . He gave a pictorial representation of Meru Prastāra, which is known as Pascal’s triangle currently. It is named after Blaise Pascal, who described the binomial coefficients in form of a triangle in 1653. The formulation by Halāyudha predates the work of Pascal by over six centuries. It is a pity that Indian history books don’t teach about the outstanding achievements of the ancient Indians and are designed to produce educated Indians who are ashamed of their heritage. History books club Jainism and Buddhism together as forms of revolt against Vedic rituals. In reality, Jains and Buddhists formed two starkly different types of minorities. While Jains were an ideal minority living in harmony with the Hindus, Buddhists were determined to eradicate the Vedic religion from its place of origin. While Jains focused on advancement of mathematical and scientific knowledge, Buddhists believed that everything there was to know was already there in Buddha’s teachings. Since the inception of Buddhism to its decline in India, not a single advancement in mathematics and sciences came from the Buddhists. The only interest of Buddhists was in their theology. All they cared about was how to convert everyone to Buddhism. They had a good understanding of psychology and used it to promote the conversion of people to Buddhism. As the Buddhist missionaries started to convert the people following Vedic culture in large numbers, alarm bells started to ring among the Vedic intellectuals. Their main concern was the preservation of the Vedas, which would be lost, if Buddhists succeeded in their mission. The efforts to preserve the Vedic literature resulted in the emergence of a substantially different form of Vedic culture defined by Rāmāyaṇa, Mahābhārata and Purāṇas. To understand this paradigm shift, we will need to go to the very origin of Hinduism and understand the true meaning of the most sacred scriptures of Hinduism, the Vedas. In the next article we will take a radically different look at the meaning of the Vedas to understand why generations after generations of Hindus for last four millennia have devoted their lives to preserving the Vedas. A.L. Basham, History and doctrines of the Ājīvikas: A vanished Indian religion, 1951, London, UK: Luzac and Company Ltd., page 16. Heinrich Zimmer, “Philosophies of India”, Edited by Joseph Campbell, 1953, London, UK: Routeledge & Kegan Paul Ltd., page 183. Bhavyānanda Vijaya, “Jain aura Bauddha ke Darśana para Nibandha”, 1957, Ghanerao, Rajasthan, India: Śrī Hita Satka Jñāna Mandira, pages 10-12 (in Hindi). R. Sridharan, “Mathematics in Ancient and Medieval India”, in Contributions to the History of Indian Mathematics, edited by G. G. Emch, R. Sridharan and M. D. Srinivas, 2005, Gurugram, India: Hindustan Book Agency, page 7. G.G. Joseph, The Crest of the Peacock, page 351. Dr. Raja Ram Mohan Roy earned his B. Tech in Metallurgical Engineering from the Indian Institute of Technology, Kanpur, and Ph.D. in Materials Science and Engineering from The Ohio State University, USA. He has worked as a Research Scientist and Project Manager for over 20 years in Canada. He has written four pathbreaking books on Indian civilization titled “Vedic Physics: Scientific Origin of Hinduism”, “India before Alexander: A New Chronology”, “India after Alexander: The Age of Vikramādityas”, and “India after Vikramāditya: The Melting Pot”. He is currently working on his fourth book on Indian history titled “India before Buddha: Vedic Kingdoms in 2nd Millennium BCE”. देश को माओवादी साईबाबा जैसे शिक्षक चाहिए या चाणक्य और अब्दुल कलाम जैसे ?